This is another lovely project with felt cloths. 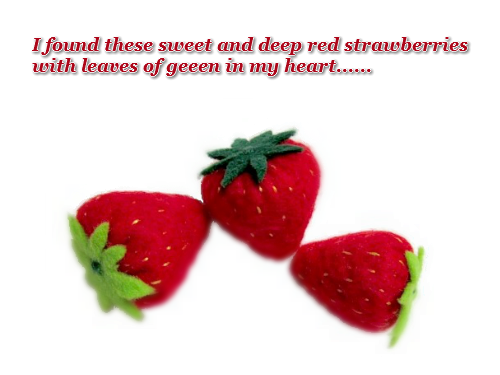 A deep red felt strawberry is seems very easy to create but must be patient in sewing the seeds ........It is quite time consuming to sew the seeds one by one. I had tried several ways to get my desired result. I used a thin thread to sew the seeds a bit more closely; I used a thicker thread to sew the seeds sparsely and finally I used a thicker thread to sew the seeds closely ....... Haha, that was the result I wished to get! I was extremely happy! That is why I always say "Making handcrafts is an endless source of delight". 1. Cut out a circle from a piece of red felt. Cut it into two semi-circles. Only one semi-circle is needed to make one strawberry. 2. Take one of the semi-circles and fold in half. Trim the straight raw edges by putting your scissor at about an angle of 80 degree from the folded edge to create a circular sector. 3. Look at the photo, this is a circular sector after trimming. 4. Fold the circular sector in half and sew the raw edge with backstitch or with sewing machine. 5. Then, turn the piece to the right side and sew a few small yellow dots(seeds) with running stitch. 6. Stuff up the piece with some poly-fill material. Run stitches all around the edge of the opening and pull the thread tightly to close it up. Make a few stitches across, knot and cut thread. 7. 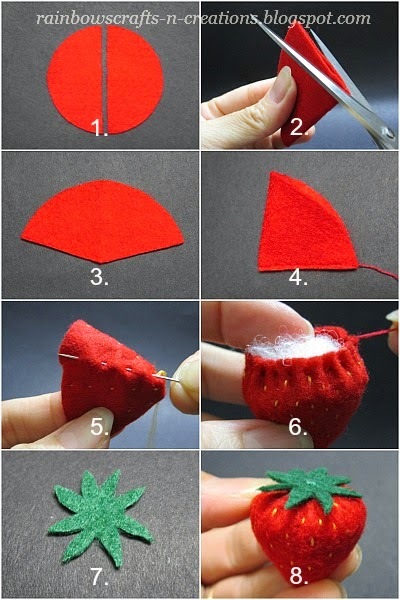 Cut out a piece of leaf from a piece of felt as shown in the photo and sew it on the top center of the strawberry. Do you like to juggle ideas? You can try to turn this strawberry into a hanging ornament, a key chain or a decorative item for your other project.